Libertarianism social policy fits snugly into the ideological framework of the American Constitution which the “Founding Fathers” seemingly intended. There is deep chasm of political philosophy between Libertarianism and the original intent of a “common good”, which runs like a thread through the Constitution. Libertarianism, I feel, will prove to be inadequate for effective statecraft on a federal, state, or local level. As an illustration of the inherent shortcomings, consider the implications of one of the basic tenets of it's political ideology; self-reliance. If you carry that to one of it's logical and pragmatic conclusions then there is scanty provision made for civil utilities like fire departments or police forces. Remember that until the end of the 19th century and beginning of the 20th century fire departments were privately owned and operated. This meant that if your home or business didn't bare the placard of one of the privately held fire departments then those companies would not respond to the fire. Fortunately, that civic mayhem has been rectified by cities incorporating the fire departments into their municipal jurisdiction. The evolution of political “common good” as it pertains to civil concepts has come to be accepted as a right of citizenship and residence and can't be easily reversed. When it comes to abject poverty and marginalization of economic, cultural and ethnic groups not only do the Libertarians receive a failing grade but so do the Republicans and the Democrats alike. I will attempt not to oversimplify but also refrain from getting mired down in the nuances of their respective ideologies. I will try to succinctly describe American's popular conception of the political parties stance on welfare as it refers to the “common good”. Republicans assume that the poor or needy, whether chronic or temporary, stick their hands out expecting a material or monetary freebie from the leaders without having to be concerned about self-reliance. This is their classic example of a welfare state kept on life support by the majority of hard working tax payers. The Democrats, in contrast, are portrayed as the weak bleeding heart handmaidens to this “nanny state”. The question arises, then, who has the moral and political high ground? Has striving for the “common good” devolved into a situation where an underclass has become so despondent that they have come to view the government as their earthly salvation? After the end of World War 2 curious quasi-religious movements sprang up on the islands of Melanesia which embodied that same despondency. Those movements yearning for an earthly salvation are what are known as Cargo Cults. 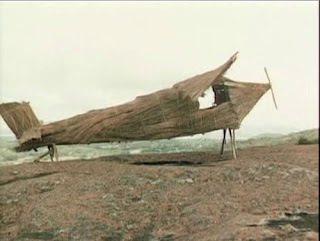 The concept of the Cargo Cult has been erroneously linked to the culture of poverty in American society. Although many aspects are similar and one can understand the spurious conclusions drawn between them and the perception of a permanent American underclass. However, as will be shown, the idea of redemption by the government doesn't hold up to scrutiny. In order to do that we will have to tease out what constitutes a cargo cult by briefly describing the John Frum movement. After we have established our parameters of a cargo cult we will delve into a lingering sociological concept that continues to obscure an objective discourse on rampant poverty and its tenacious staying power in the United States. The outdated sociological concept of a culture of poverty is behind this ideological conundrum. Cargo Cults, like The John Frum movement of the island Vanuatu, emerged during World War 2. These small islands were used as weigh stations and springboards for thousands of American troops in the Pacific Theater. Anthropologists view Cargo Cults arising out of encounters with an outside culture which stand out in contrast to the indigenous culture as it relates to material wealth. There develops a mysterious reverence to the outsiders because the local population can't comprehend from where such a limitless supply of goods and resources originate. The local peoples assume it's the workings of magic which is perhaps summoned from the spirit world by veritable gods. While the war raged on in the Pacific these cargo cult built symbolic airstrips for the planes and erected statues of airplanes made from palm fronds and coconuts. They even built churches with coconut radio transmitters to contact these gods. Once the Americans had withdrawn from the Pacific Theater following the end of WW2 the Cargo Cults took an even greater mythical hold on the local population. They began venerating those symbols of the gods. They prayed for their return when they hoped the gods would bring with them the material wealth of the spiritual realm. As was told to Paul Raffaele of the Smithsonian Magazine on his visit in 2006 by a ranking member of the John Frum movement; “John promised he’ll bring planeloads and shiploads of cargo to us from America if we pray to him...(like) radios, TVs, trucks, boats, watches, iceboxes, medicine, Coca-Cola and many other wonderful things.” These pre-literate island cultures were in awe of the material wealth and benevolence of the gods who descended upon them. There were no precursors for grasping on an abstract level why the American soldiers were being supplied and from where these supplies came. It can easily be seen how these local populations could succumb to deifying those gods and in turn, on a deep cultural and religious level, expect the gods to care for them. They were inadvertently thrust into a cycle of subservience; a culture of poverty. The culture of poverty was a mid 20th century (1959) sociology paradigm that was able to garner both wide spread acceptance within academia and coffee shop pundits. Originally it was conceived by social anthropologist Oscar Lewis in his book titled “Five Families: Mexican Case Studies in the Culture of Poverty.” Lewis' ethnographical study of this Mexican subculture delineated how exclusion from the overarching dominant culture tended to influence the subculture to modify and adapt. Due to the lack of resources, like second language acquisition, formal higher or skilled education and absence of community role models, subcultures manufacture aberrant value systems from the generally accepted social norms. As a side effect of this insular enculturation these value systems were in turn inherited by the children. This precipitated the generational adoption of these mores and norms and thusly, allowed them to be perpetuated. Furthermore, Lewis postulated that because these mechanisms of adaptation have been engrained so thoroughly in the members of these subcultures, notably children, they are inevitably held captive to those ideals and social conventions. This ultimately leads to a perceived continuum of an underclass; a culture of poverty. During President Lyndon B. Johnson's “new deal” the concept was used to describe the plight of the urban ghetto namely, the black communities. It has since lost most of it's preliminary luster because of the work of modern sociologists, like harvard professor William Julius Wilson, who turned the argument on its ear. He claims that many ethnic groups choose to isolate themselves from the homogenous American culture. The many China Towns found in American's urban settings is testament to this voluntary isolation. Asian immigrant populations tend to cluster together and in doing so establish networks of support for the newly arrived emigres. Of course, there are other ethnic groups who adhere to the same clustering after immigration; like Eastern Europeans or Caribbeans. Wilson asserts that the main reason for a perceived culture of poverty is the lack of social role models in the impoverished areas of America. A mixture of socio-economic classes are required to exist in close proximity to one another in order for them to interact on a meaningful level. Most notably the middle class has a pivotal role to play in this drama. The struggling underclass is not incapable of learning and adapting if given a fair and even chance to succeed. The fact that there is an exodus of the middle class from these areas proves the point that success is at least attainable. The real concern isn't a Cargo Cult mentality which is perpetuated from generation to generation. The focus shouldn't be on vilifying the underprivileged as gullible and lazy. The main thrust from all political parties should be eradicating the ghettoization of America. Mandating the “common good” is what being an America is all about.